Three minutes into the race, an Army guy attacked and I happened to be in a good position to respond quickly. We formed a four man breakaway and, surprisingly, no one seemed to chase. We put in some hard efforts for the first few laps and realized we opened a ~20 second gap. I know I’m certainly not the strongest in the group, so I did everything I could to not get dropped from the break: pulling mostly on the hills, relaxing on the downhill, and being the first to take the corners to avoid a big acceleration, which overall saved me some legs for the sprint. Finally it came down to the last lap, at that time we were down to three people, and we were all equally toasted. Despite a 30-second gap, the army guy seemed to be worried about being chased back by the group and was still doing some hard efforts pulling the two of us. 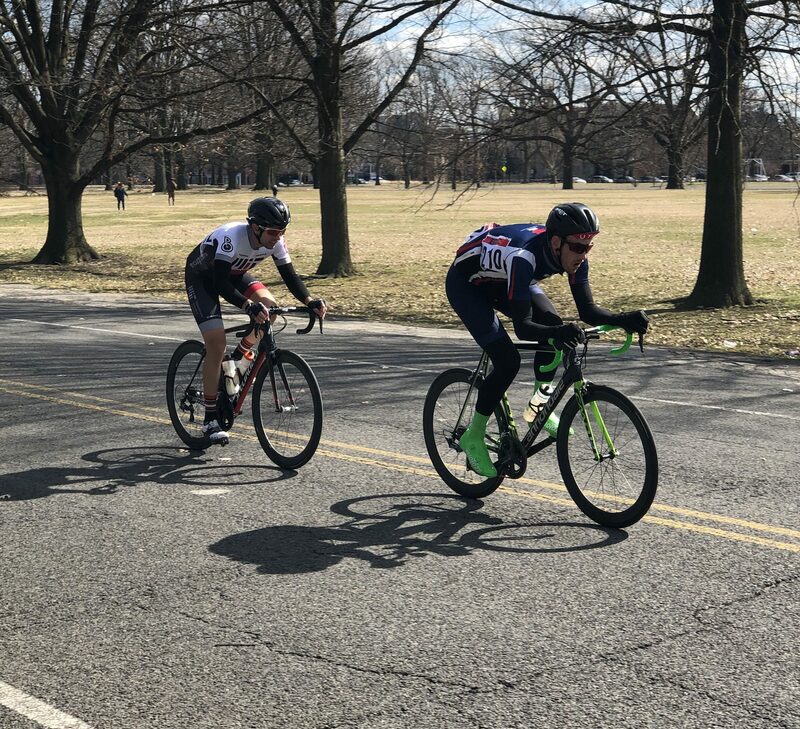 I was barely holding his wheels and was really just aiming for third place (which honestly I would be super happy about for my first C’s race!). On the last uphill to the finish, the army guy went super hard and tried to get away. Fortunately I had some weight advantage and was able to close the gap, then suddenly it was down to him and me for the downhill sprint to finish. With the finish line in sight and the only enemy in the front, I could feel my heart beating faster and faster. I could tell that he gave everything on the climb and probably wouldn’t be able to contest the sprint, but I waited patiently until the last 100 m to start my sprint and quickly flew pass him to claim my first win in Men’s C! Jack receiving the Most Aggressive Rider Jersey for winning his first C race! Other notable finishes for the circuit race include Guillaume getting 2nd in men’s D, Amy and Tori finishing 3rd and 5th in women’s A, and Berk finishing 6th in men’s A despite a flat late in the race! Resting the legs (and enjoying some Harry Potter) in the few hours between the circuit race and hill climb. “This year, Penn State pulled an MIT-Men’s-C’s-two-years-ago on all of us. 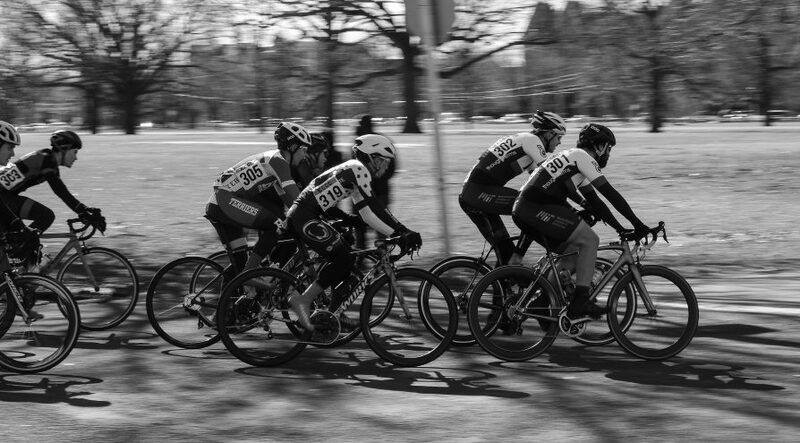 Instead of having a friendly stroll up the initial false flat, they brought the pain train, stretching the entire Men’s A field into single file. Most of us were quite gassed from the circuit race that morning, so we were content to draft for dear life. Once the pitch increased, the train dissolved, only to be replaced with eager would-be attackers. 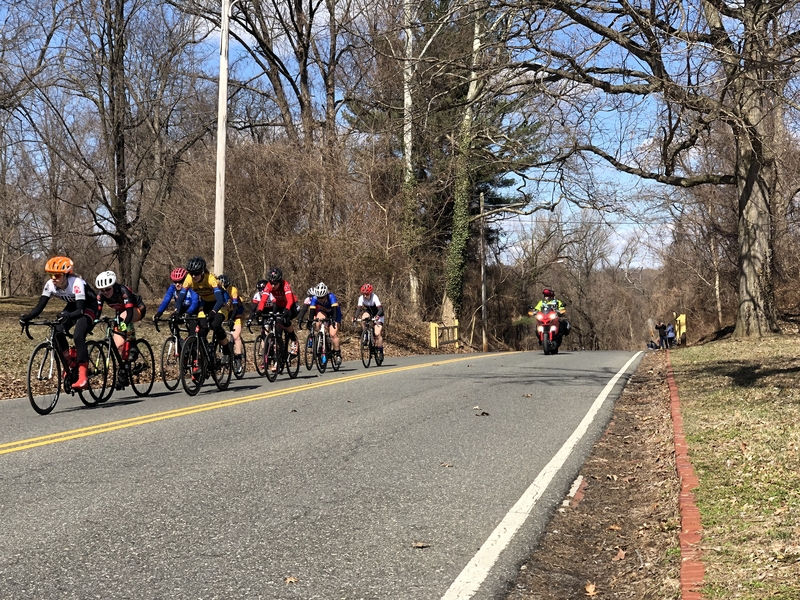 The first few moves in the rolling uphill section were indecisive, but eventually a group of two attacked in one of the steeper sections and got away. Nic and Guillaume lining up for the men’s D road race. 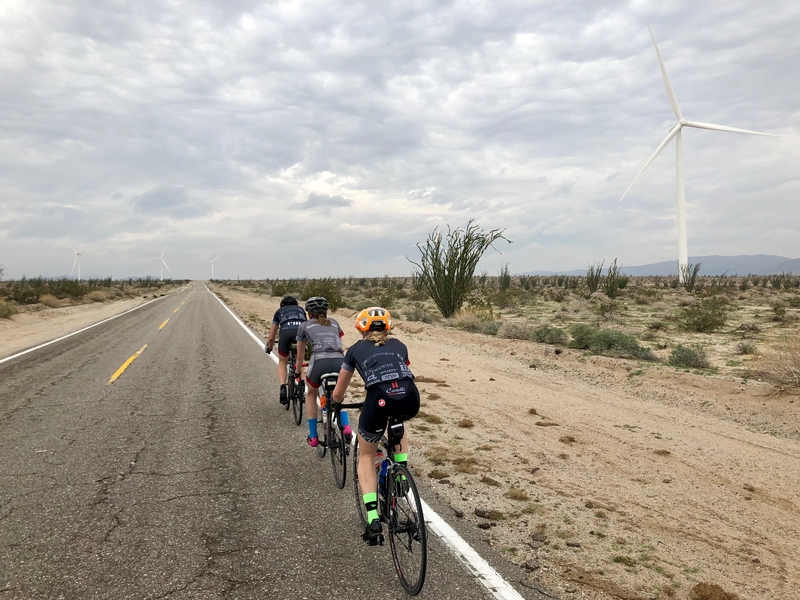 “As we lined up for the road race, the sky looked quite ominous, so I was hoping that this would be a quick race, rather than 59 miles of lollygagging (which is not uncommon in the women’s A/B races). Fortunately, others seemed to share my hopes, and the first two laps, which bypassed Horse Killer Road, passed uneventfully, but at a reasonable clip. However, our last two laps both included Horse Killer Road, so I knew the comfortable pace would come to an end. Horse Killer Road was as steep as advertised, featuring grades as high as 13%, but fortunately (or unfortunately for those who like climbing…), the steepest part only lasted a few minutes. Our pack split up on the hill, but within a few miles of the climb, a lead group of 6 had reassembled. We pacelined for the rest of the lap as the ominous clouds turned to drizzle and then to rain. Tori and Amy passing through the feed zone in the women’s A/B road race. 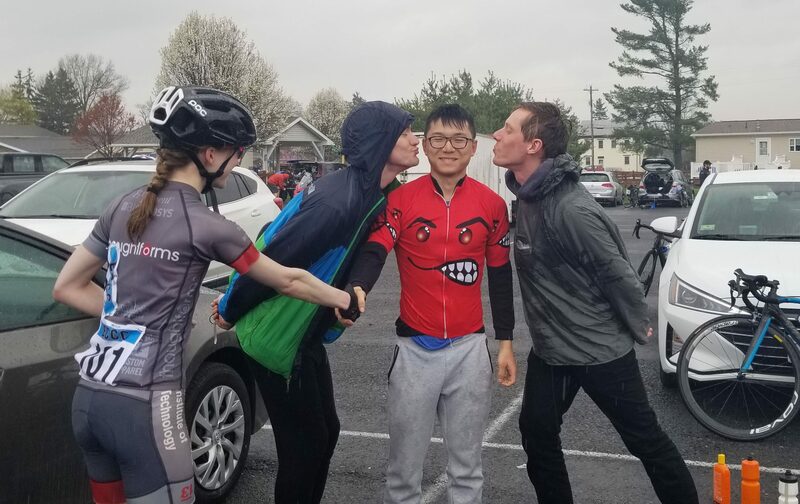 Guillaume also finished well in the road race, taking 4th in men’s D.
After the road race we all piled into the cars for the long and rainy drive back to Boston. 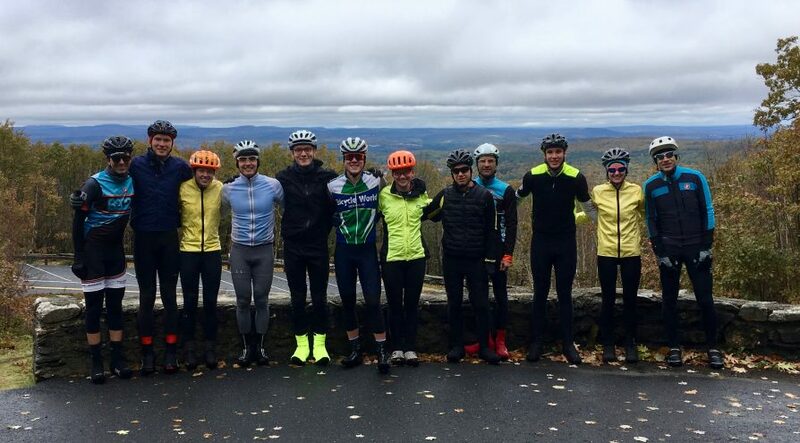 We’re looking forward to a weekend off from racing to prepare our legs for the ECCC Championships in Vermont in two weeks! 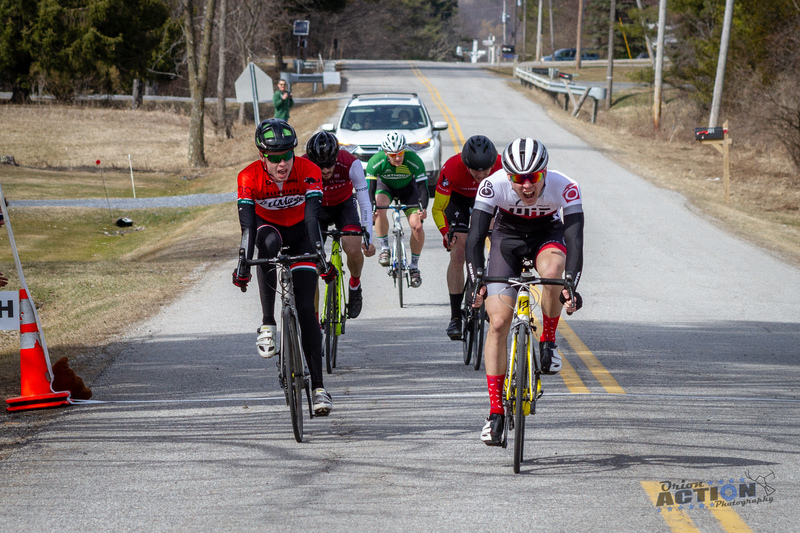 For our third race weekend of the season, we headed north for L’Enfer du Nord. 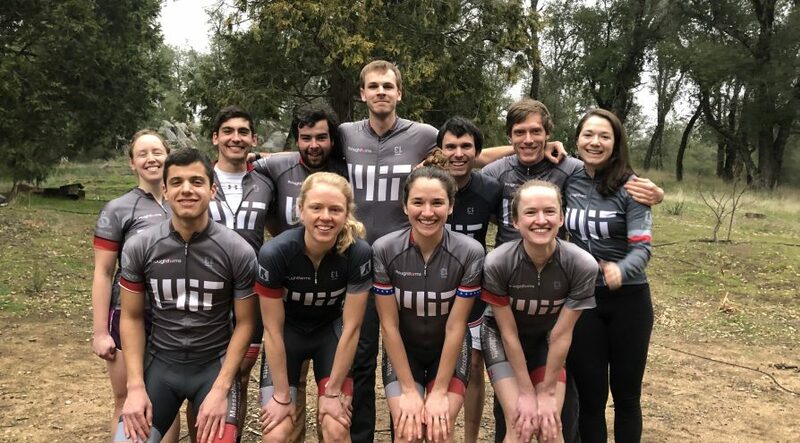 MIT was a force to be reckoned with, bringing 19 riders including 5 first-time racers! A huge thanks to @orionactionphotography for taking some of the pictures in this blog. 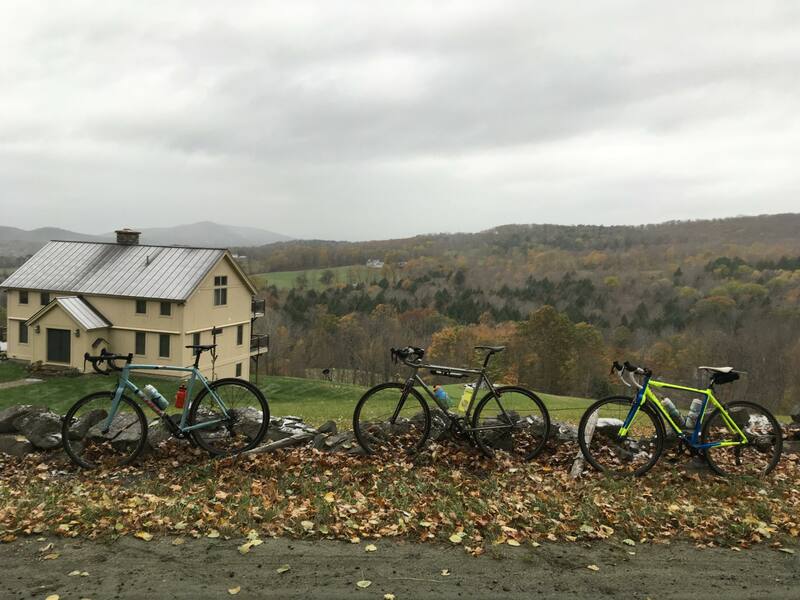 “When I started out going on leisurely coffee rides with MIT cycling this fall, I thought to myself, ‘this is fun, but you’ll never catch me at a race.’ So then why was I helping load up cars at a Quality Inn in Quechee Vermont at 6am on a Saturday? I was asking myself the same question. But early doubts (and early wake-up calls) aside, it was one of the best weekends I’ve had in a long time. 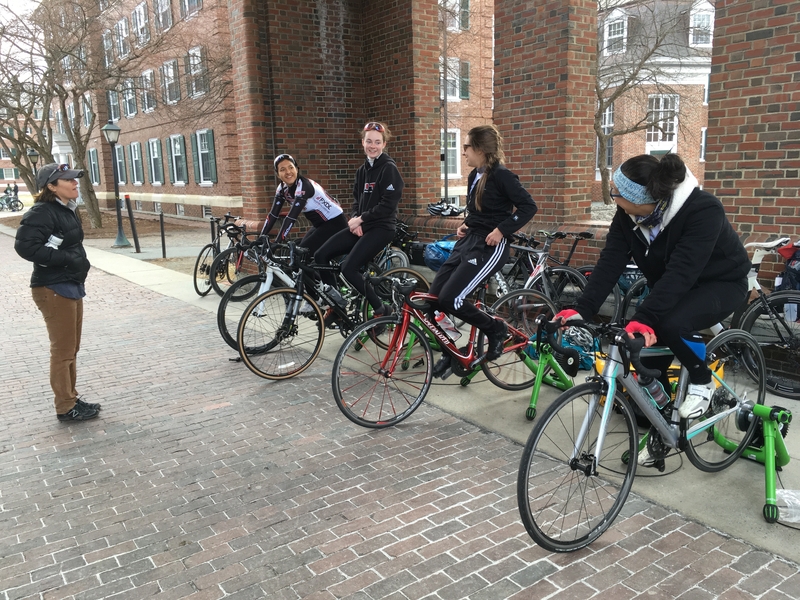 The women’s D riders warming up and talking strategy with coach Nicole. The racing was split over two days, with Saturday being the individual time trial (ITT) and criterium. 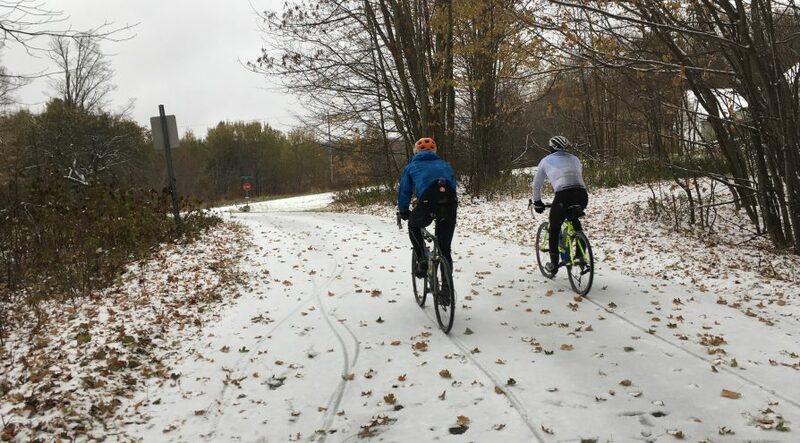 We arrived early enough on Saturday morning to preview the 3.5 mile ITT course, which featured a half mile climb out of the gate and some residual snow from the night before. Since I had never raced before, I figured this was my best opportunity. 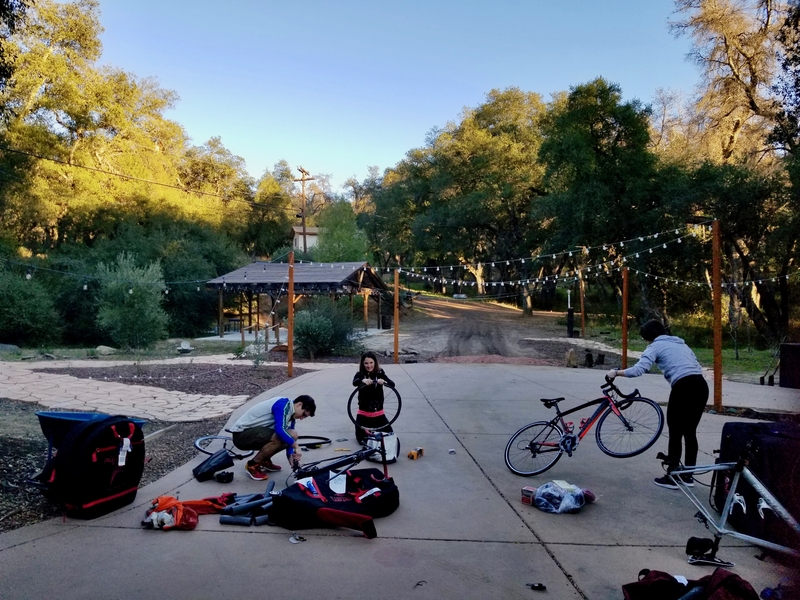 Unlike other events, this required little strategy: just go all out (I believe the technical term is ‘full gas’ – I learned a lot of new vocab this weekend) for 10-12 minutes. I think I more or less achieved that goal, based on how truly awful I felt afterward. I was able to pass two riders on the first climb, and ended up in 4th in the women’s Ds. The crit was the event I was more concerned about, since the potential for catastrophe seemed high. In the end, it was really just a 30 minute blur. I was vaguely aware that three riders attacked at the start, but I kind of lost track of them halfway through (had we caught them? I wasn’t sure. My mental game needs some work). 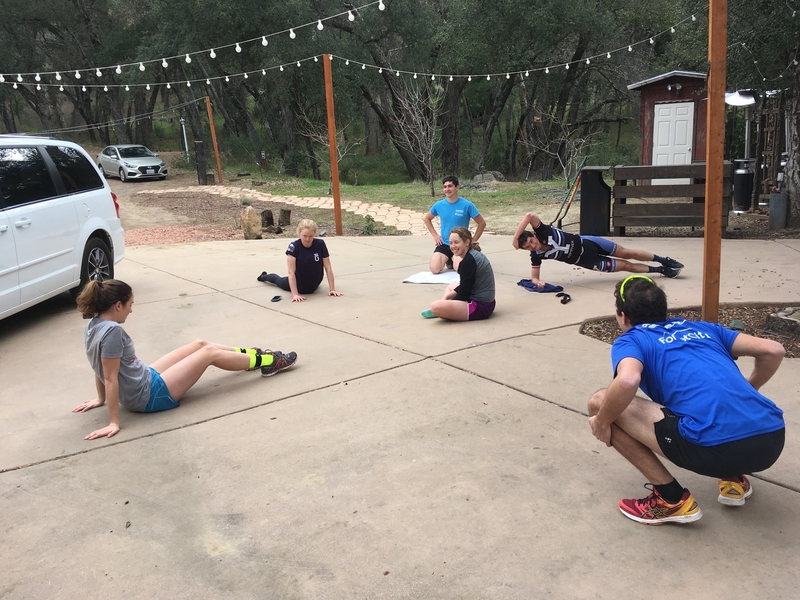 But a real highlight was working with two MIT teammates in the last two laps (Cat Romero and Julie Takagi) to collectively finish strong (5 for Cat, 6 for me, and 11 for Julie). Berk attacking the men’s A field in the frat row criterium! Women’s C – Sarah 1st!! 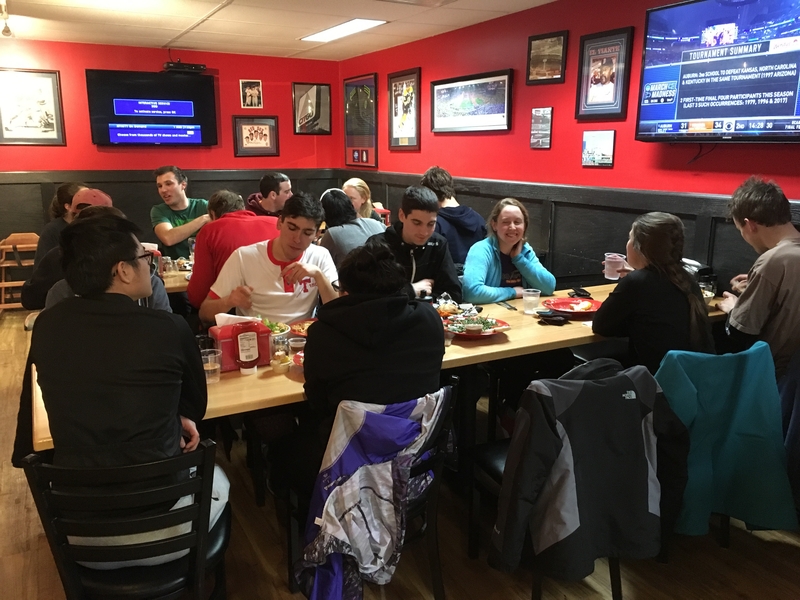 A lot of hungry riders at our team dinner on Saturday. 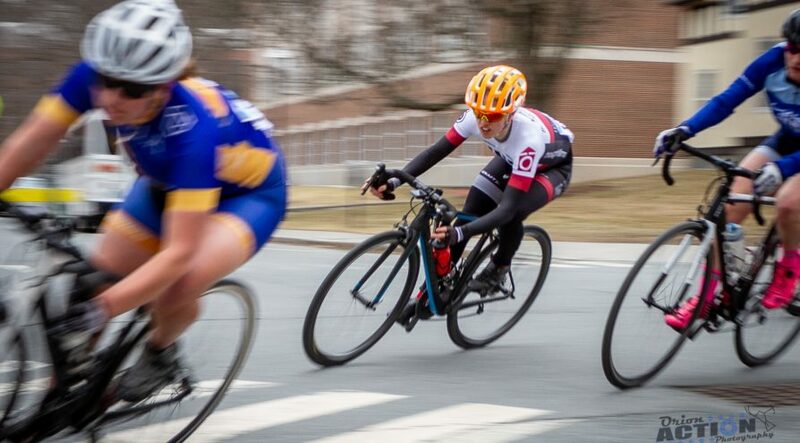 “I was super excited leading up to this weekend — I raced the Dartmouth crit last year for the first time and loved it, and the road race course got snowed out so it was great to finally have the opportunity to race it. All of my racing success last year came when I made it into a breakaway, and I was determined to make it into a break during the crit and road race. Unlike last week’s Men’s B races at Bucknell, both of our races started off pretty hot from the gun. 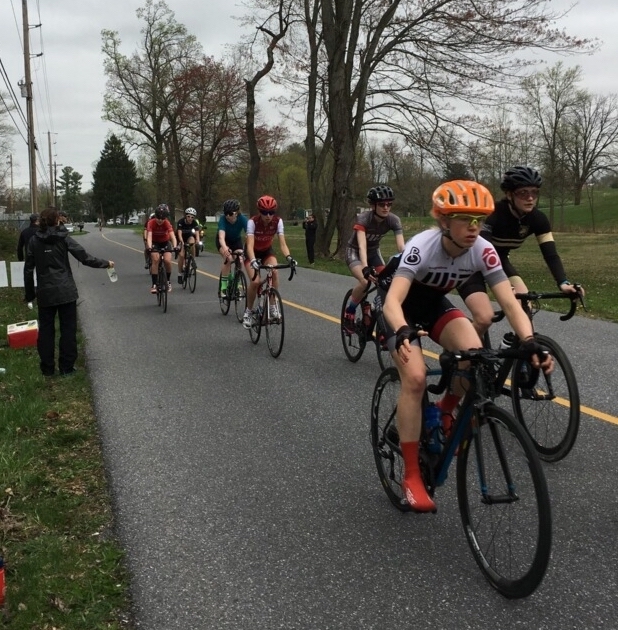 In the crit, McGill cycling hit the front just a few seconds into the race, a sharp contrast with the relaxed and chatty first few laps of the Bucknell circuit race. 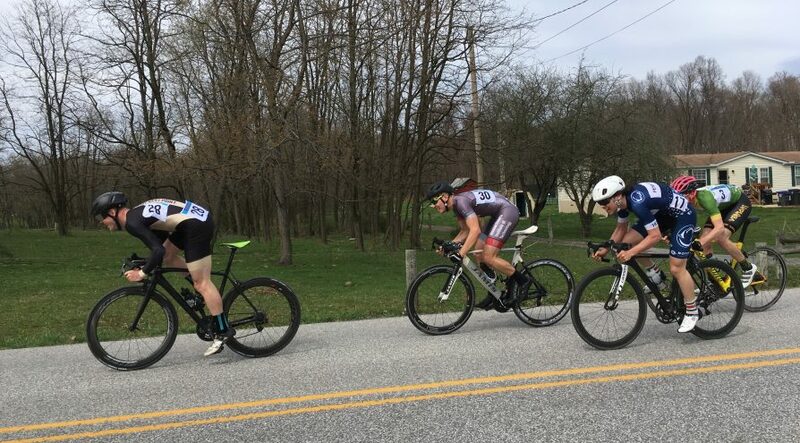 I got in one move and was off the front for an entire lap, taking a prime, but ultimately nothing stuck and I finished in the middle of the bunch after losing my position for the sprint. I was a little frustrated because I knew that my legs were good, yet the cards just didn’t line up during the crit. 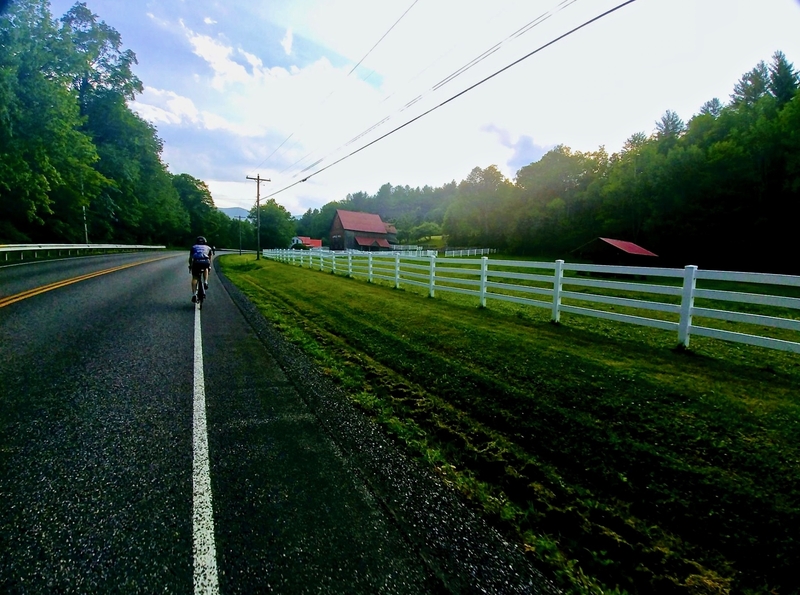 Sunday’s race was held in the beautiful Vermont countryside near Middlebury College — it was probably the most beautiful course that I’ve ever ridden, but unfortunately I didn’t have much time to take in the scenery during the road race. 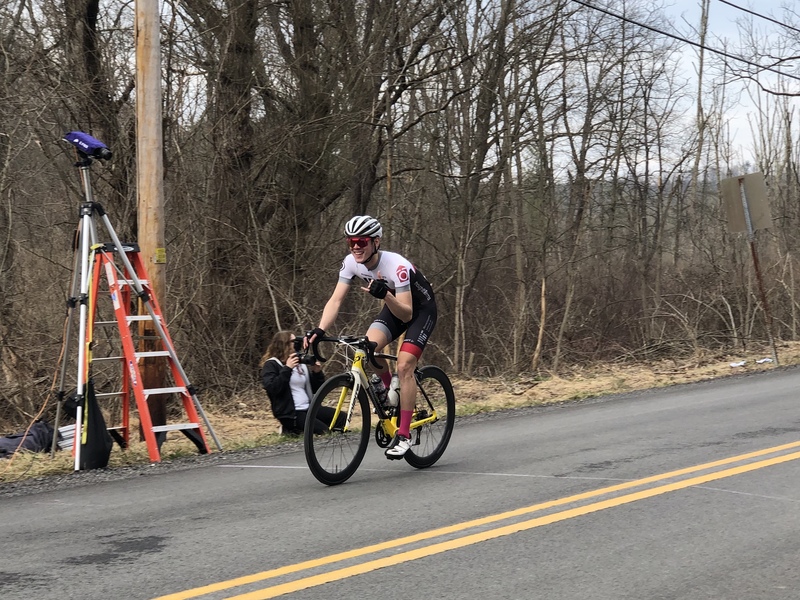 A lone rider from Columbia went up the road just after the neutral start, and the pack spent the first 15 miles of the race slowly pulling him in. Again, I knew that I wanted to make it into a break — I attacked once, and followed another move, but ultimately both were caught. Just after the second move was caught, however, another move went — and I could tell that this one would probably stick because of the riders in the move. 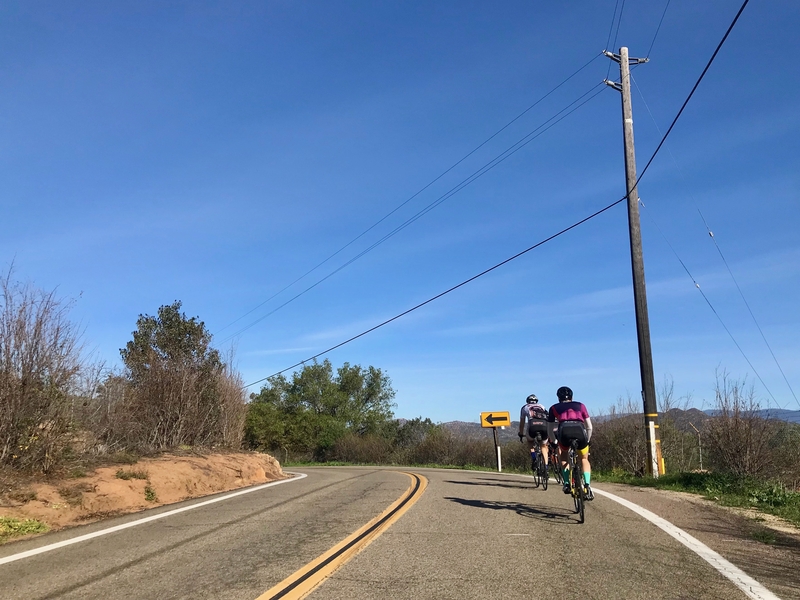 I bridged up to the five-man move, and the next ten minutes were completely full gas as we tried to establish a gap from the group of riders behind. 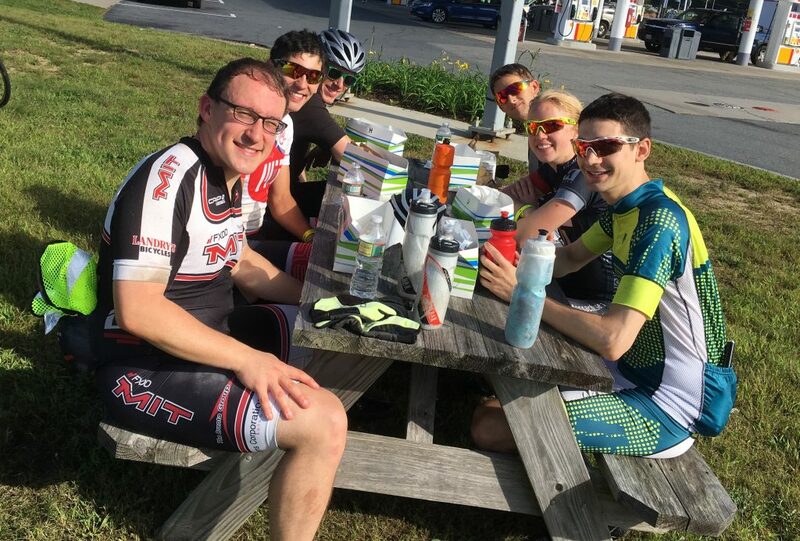 The next 30 miles were really tough riding, but thanks to some expert handups in the feedzone (thanks Nic and Dmitro!) I was able to stick with the break. Liam winning the sprint in the men’s B road race! The women’s A riders also dominated the road race with Tori winning and Amy finishing close behind in 5th. In the Women’s C, Sarah came in 2nd and in the Men’s C, Miles placed 4th. In the Men’s D, Jeremy, Guillaume, and Jack took 9th, 10th and 11th places and in the Women’s D, Catalina snagged 9th. 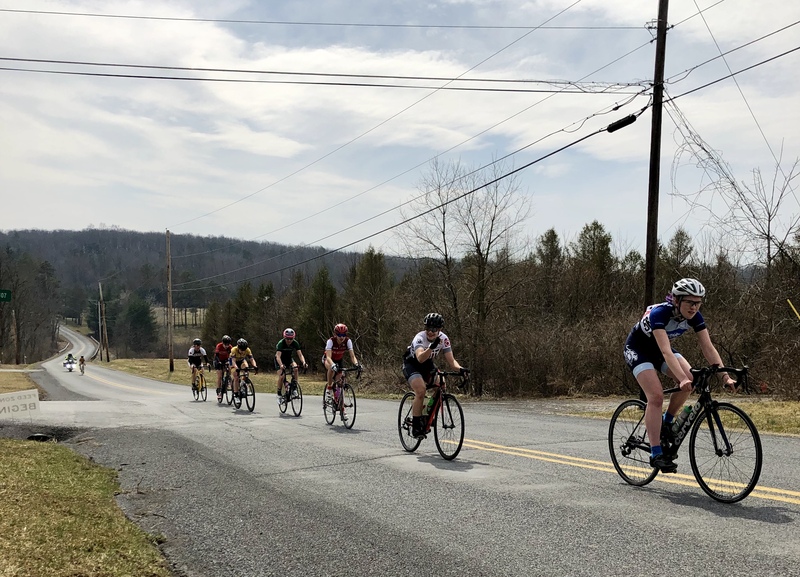 This weekend, some of our riders are braving the long drive to Shippensburg, PA to tackle the “Horsekiller road race”, featuring the steepest climb of the season. 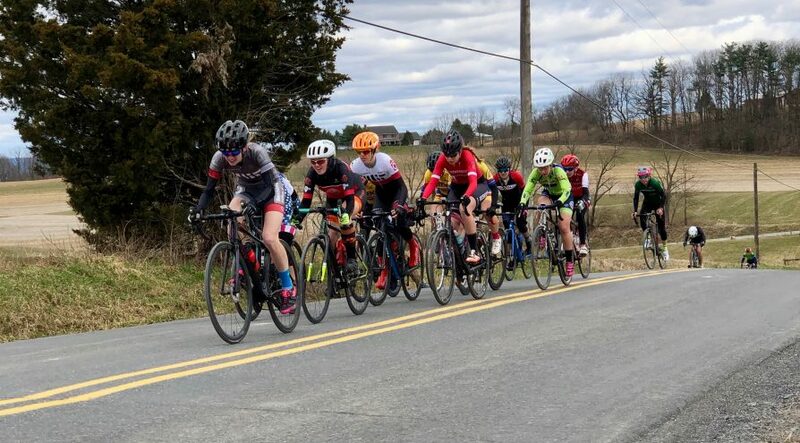 With a two week gap of not racing after the Philly Phlyer, we were all itching to attend our second race weekend of the season, the Bucknell Cycling Classic! 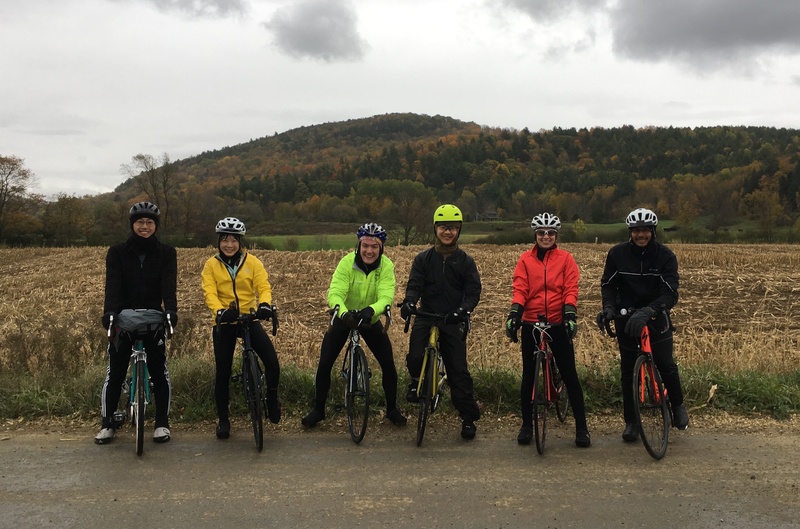 Ten of us made the trek down to Lewisburg, PA, home to scenic country roads, horse-drawn buggies, and no shortage of hills. Up first was the team time trial (TTT) on Saturday morning. 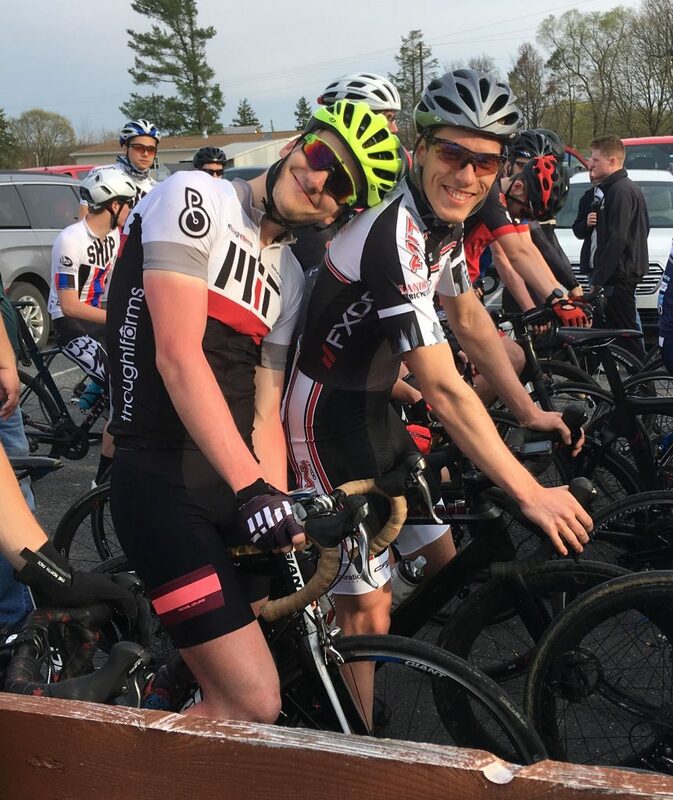 With both Quinn and Berk having upgraded to the As, we were able to have both a women’s and men’s A TTT team, finishing 1st and 2nd respectively. Impressively, Dmitro and Guillaume achieved victory in the men’s C TTT, despite the majority of the other teams having a full four members! The women’s A TTT team, with national champion Emma in her stars and stripes jersey! 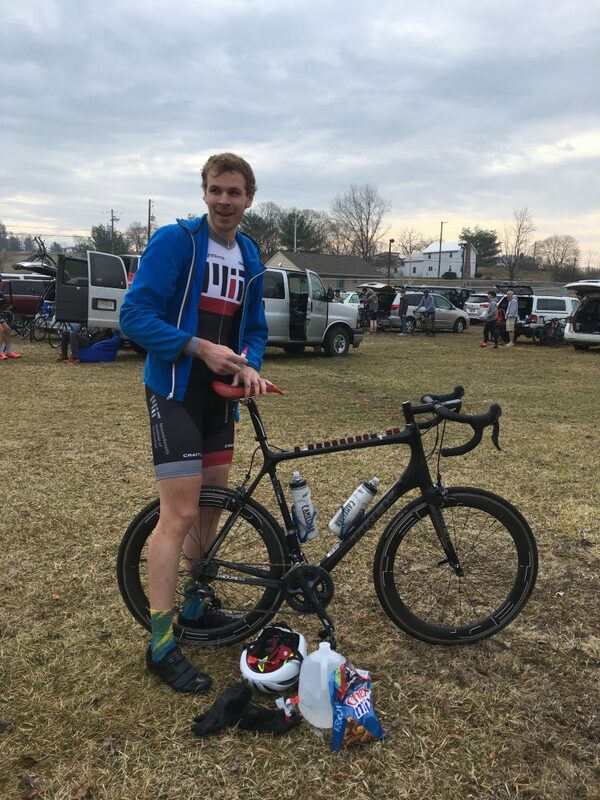 “I was really excited to race the Bucknell Cycling Classic: rolling hills, back roads, and racing with a significant number of teammates in my field. I moved up to the Women’s B category which meant I was able to mix in with Emma, Amy, and Tori in the Women’s A field. 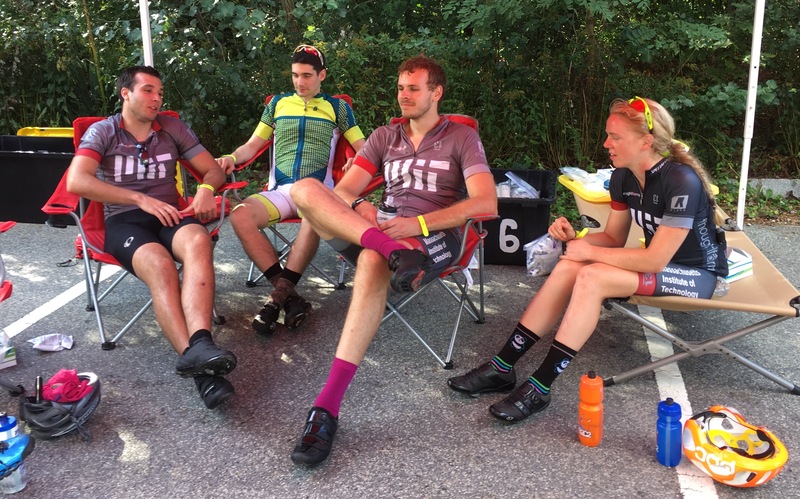 Four MIT jerseys in a usually small field meant that we had high hopes to strategize the race for an MIT win. 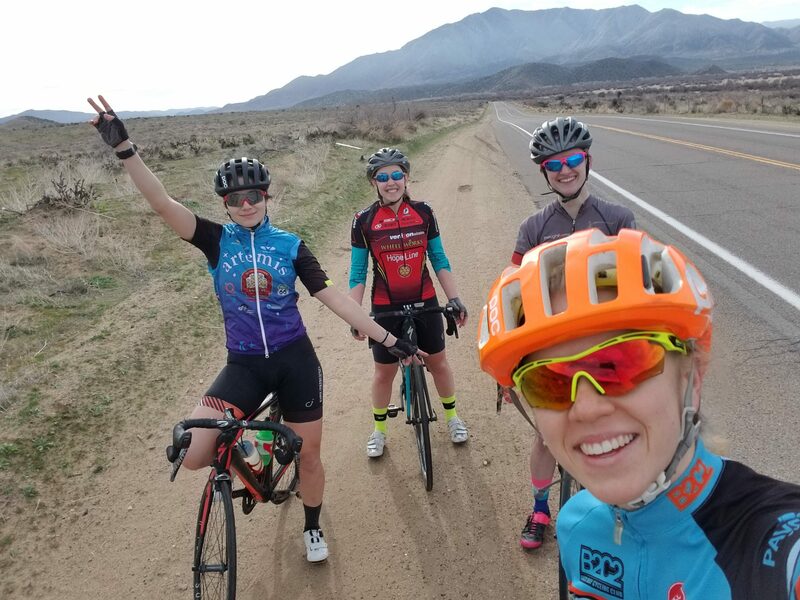 We knew that my punchy climbing would be a useful way to send off an attack early on in the 50 mile race, that Emma and Tori would be able to push the pace, and that Amy could get up all the climbs after everyone else’s legs were shattered. Before lining up for the road race, we set off in our sleek TT helmets on a rolling and unforgiving TTT course. I was pretty quickly dropped from our TTT rotation, but the team managed to win by a margin of a minute over the second place team. The TTT truly requires skills that I have never developed in cycling, as it’s such a well-oiled and mechanical event. It will take a lot more practice to be able to stick onto the wheels of my teammates, but I’ve really enjoyed how much teamwork is involved in this dynamic event. Miles preparing for the road race by setting a new record for the most Clif Bloks stuck to a top tube. Joanna excited about how well she is blocking for Amy, Emma, and Tori in the break up the road. In the men’s races, Guillaume finished 8th in a massive D field of 82 riders, Miles and Dmitro scored some points in the men’s C field, with respective 9th and 11th place finishes, and Liam (his first race in the Bs) and Berk and Quinn (their first races in the As) held their own and finished strong! At the end of day, everyone was pretty exhausted, having given it their all on the challenging course. Liam crossing the finish line in style. After a good night’s sleep, we were ready for the circuit race on Sunday. A beautiful day for a circuit race! Guillaume powering his way up a climb in the circuit race…the rest of the field left in his dust! 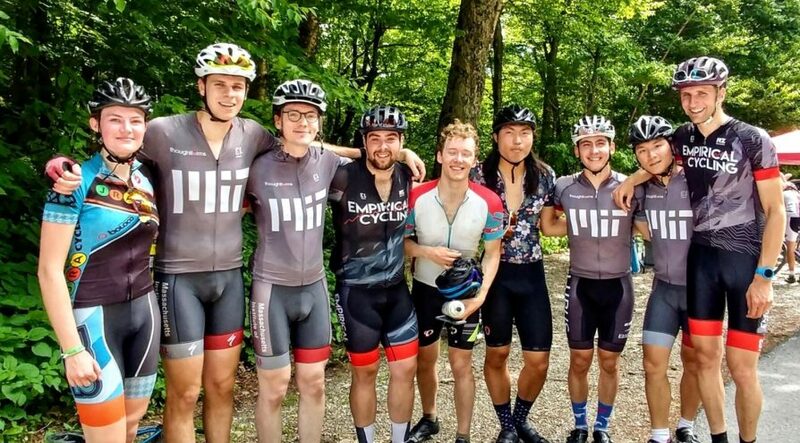 Again, in the circuit race, MIT had strong performances. For the men, Miles and Dmitro finished 3rd and 9th, respectively, in the Cs and Liam came 6th in the Bs. For the women, Emma, Amy and Tori finished 2nd, 5th, and 7th, respectively, in the As with Joanna getting 2nd in the Bs. 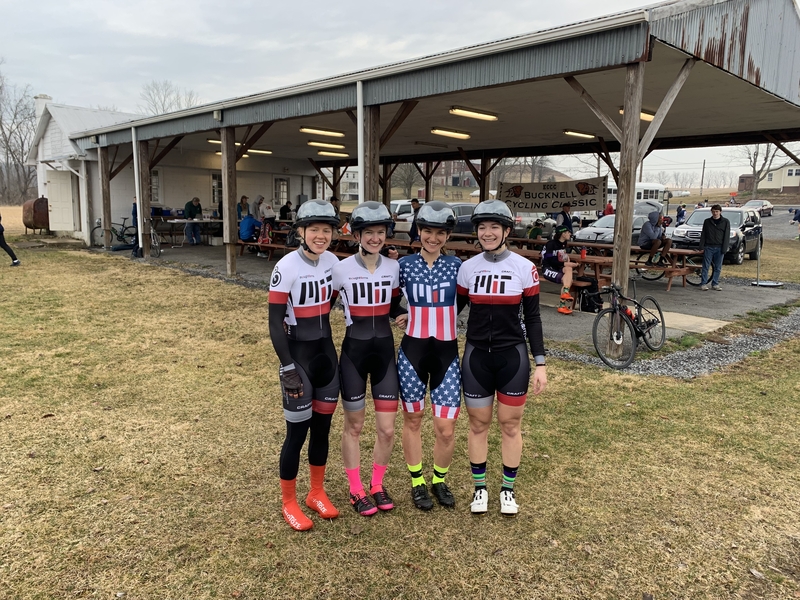 With two race weekends under our belts, we are currently 2nd in the overall omnium and are looking forward to another great weekend of racing coming up at L’Enfer du Nord! 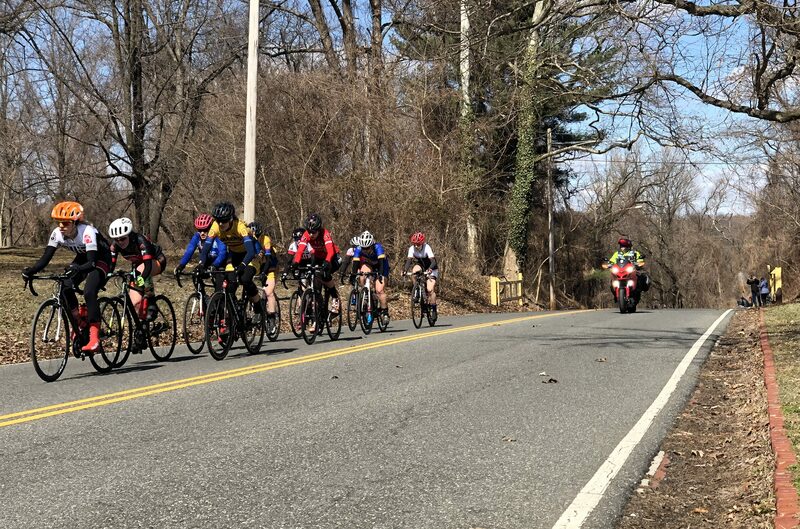 Our first race weekend of the season, the Philly Phlyer, got off to an inauspicious start, as we encountered several mishaps in the first event, the Team Time Trial. First, as we rolled up to the start line, Nic discovered that one of his tires was flat, and without time to fix it, his teammates Jeremy and Guillaume proceeded with the men’s D TTT without him. To make matters worse, Guillaume’s seat post was not properly secured, causing his saddle to slip down during the race, and making pedaling rather difficult. The men’s B TTT was less eventful, though Miles described it as “pure torture”. As for the women’s A TTT, our race was riddled with confusion. 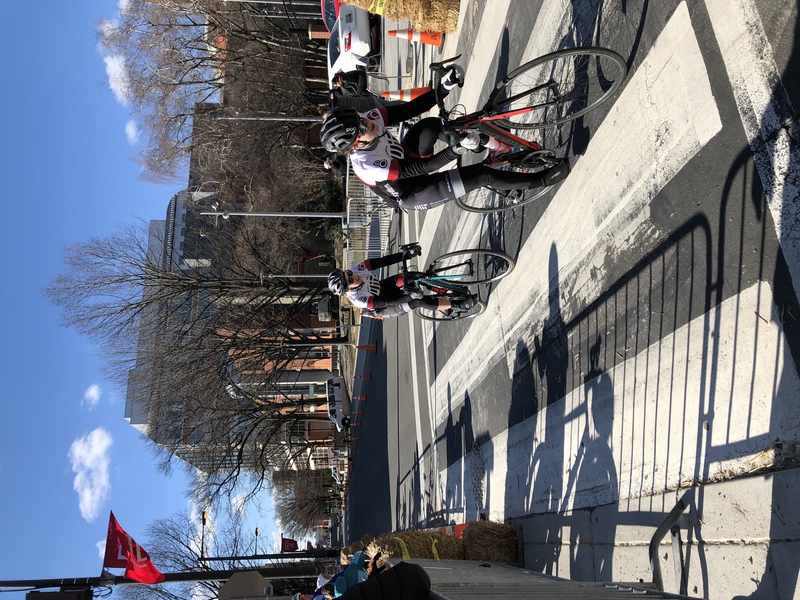 The Philly TTT course is a bit tricky as it covers parts of the course twice and includes 4 U-turns, but Tori and I had raced it before and had carefully described it to Joanna and Sarah, so we were feeling well prepared at the start. However, 30 seconds into our race, we encountered barriers across the course, and a marshal waiving us to turn left, off the course. 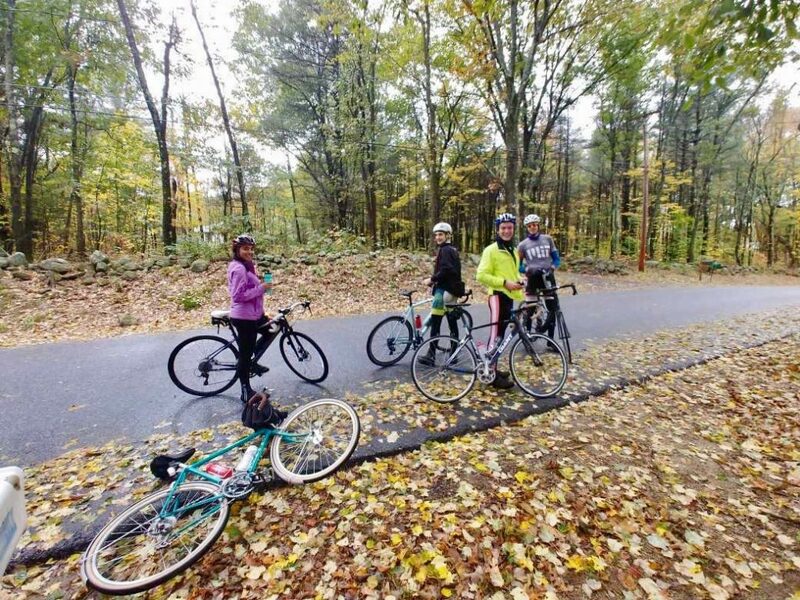 Tori followed his instructions and the rest of us followed her around a roundabout, down a potholey descent, and eventually back onto the official course. Despite lingering concerns about whether we had navigated the course correctly, we settled into a rhythm on the flats and started picking off other teams. However, as I led us into the third U-turn, around mile 7, confusion struck again — there was no gap in the cones indicating where to U-turn! Instead, the marshals emphatically waved us straight up the hill towards the finish line. I followed their instructions, but at this point had no idea where this course was taking us, or whether we were even following the correct course at all. We crossed the finish line a mile later, all of us still feeling energetic because we had paced ourselves for 3 more miles of racing! 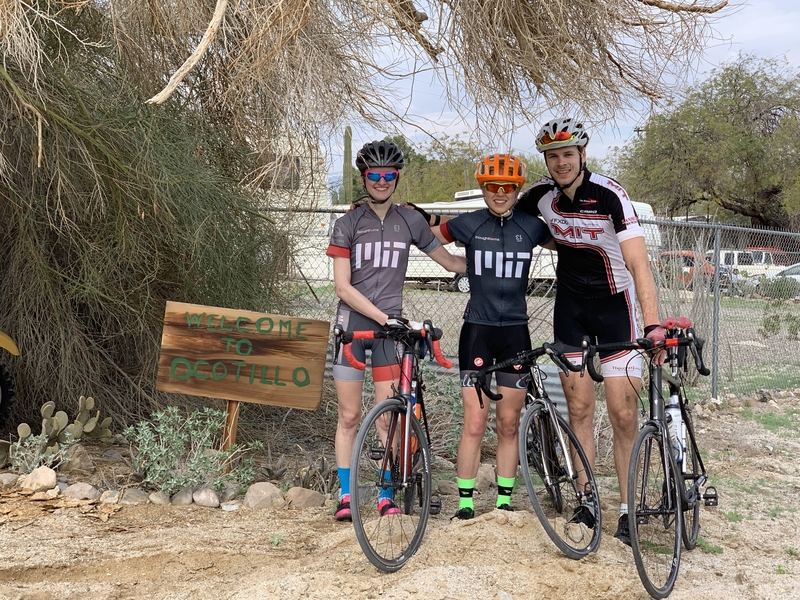 After finishing we quickly found our other MIT teammates, who confirmed that the course had been modified and shortened at the last minute due to flooding on the original course (“they didn’t tell you at the start line?!”). I was bummed that our race finished unexpectedly 3 miles early, because that meant it didn’t provide much feedback about how well we paced ourselves. Nevertheless, it was hard to be too upset about that because, despite the mishaps, all 3 of our TTT teams won their category! “I came to Philly with high hopes. After a lot of hemming and hawing, I decided to do one last race in the B category before making the leap to the A’s, where I know that results will be a much more distant possibility. So with one last weekend in which I had a shot at the win, I was hyped and eager to see what I could do! The only problem: every year that I’ve raced this course, my field has ended in a bunch sprint and I have a terrible sprint! 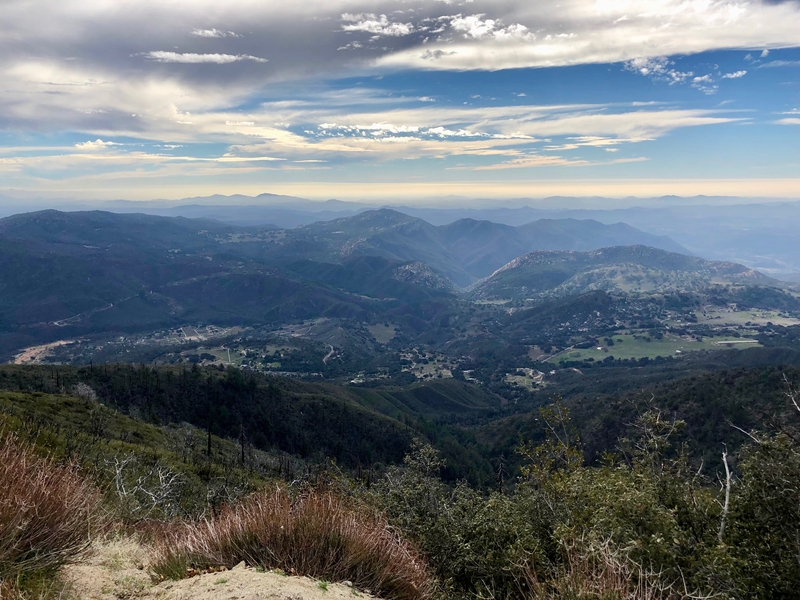 The course features short climbs and long windy sections that give the bunch an advantage, but I knew I needed to break away if I was going to get a result. So I came in with a plan to take the first lap (out of five) to feel out the pack’s climbing and decide on a good place to try and make a move. I hoped to go with one or two people around half way through our 32 mi race. Our first time up the climb, a really strong-looking rider started to get a bit of a gap. After a long pull in which I tried to keep the gap to a minimum, I turned around to ask for help from others in the bunch but got none. Instead, someone said “well, this is a long race to try and do solo” explaining he saw no need to come to the front to help pull the rider back. (Note that this is the shortest road race on the calendar.) Annoyed with the bunch, I figured I would join this guy and see if we could make them regret their complacency! With a quick attack, I was able to bridge up to the rider with one other last racer from the peloton. Quinn and his new super strong friend. Nic is psyched for his first road race (take 2)! 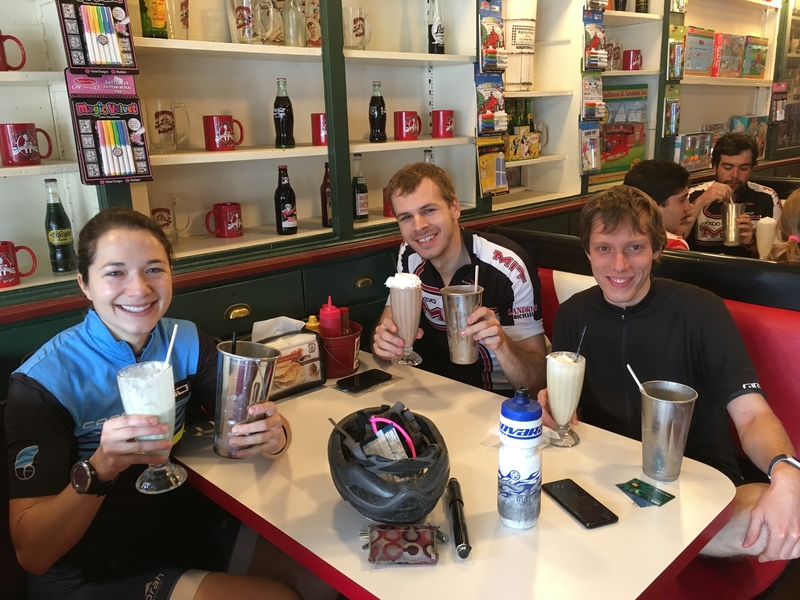 Our other MIT riders finished strong in the circuit race as well! In their first ever races, Jeremy and Guillaume finished in the top 10 and Nic in the top half. In the men’s C race, Miles took 2nd and Dmitro 16th. Joanna raced off the front of the women’s C race, finishing 4 minutes ahead of the next person, and Sarah took 3rd. The women’s A/B race came down to a bunch sprint, with Tori finishing 2nd and Amy 7th. Tori leads the women’s A/B pack up a hill. “Waiting at the start line of my first ever criterium in the heart of Temple University’s campus, I felt an interesting combination of excitement and caution. 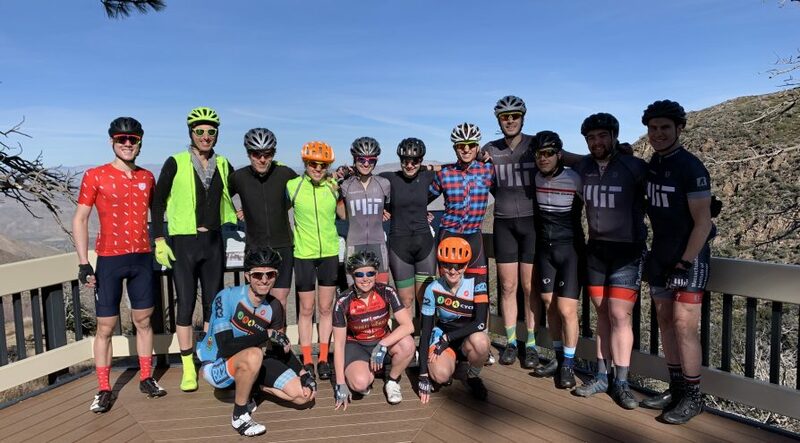 This was the event I felt most unprepared for, and futile thoughts about how I should have attended one of the team’s cornering clinics didn’t help. 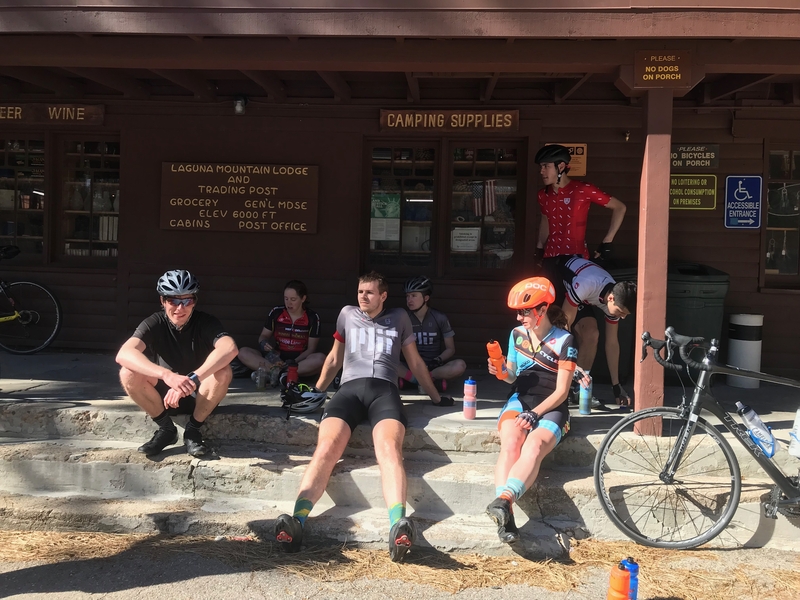 Even though the enormous field of 91 Men’s D riders had been split in two for this race, the idea of squeezing through narrow alleyways and tight corners in a jostling gaggle of inexperienced, adrenaline-fueled riders was reason enough for trepidation. Yet I was also still riding yesterday’s high of a great first ever day of racing. I wanted to attack this race in a way I hadn’t done during the road event. Unfortunately, my nervous energy did not immediately translate into performance. 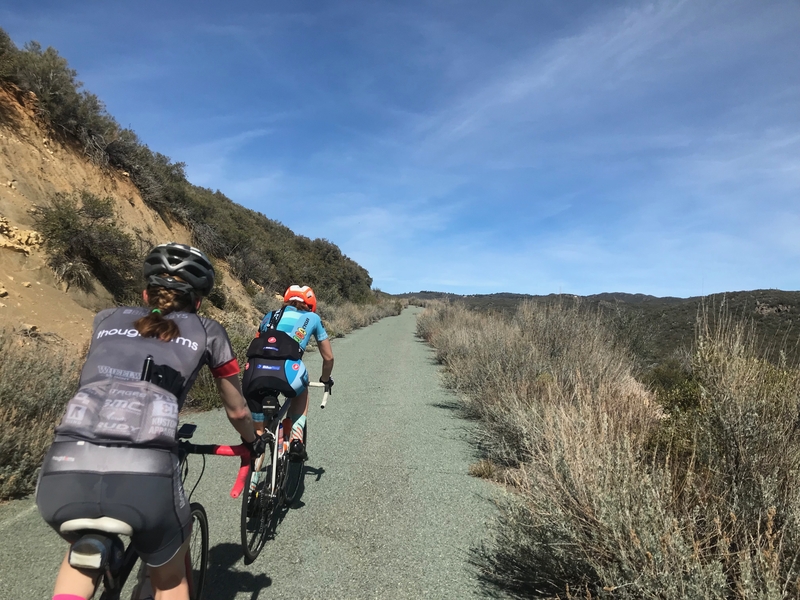 I struggled to clip in at the starting call, and after eliciting the vocal frustration of other riders trying to push past, I quickly found myself at the back of the pack. I burned through the first lap sprinting back to the front of the field, determined not to get trapped when the pace picked up. Happy that I was back where I needed to be, I worked with Guillaume to push an aggressive early pace. Too aggressive it turned out, as I soon felt gassed and needed to sit in while a separate pair of UVM riders was able to break away. 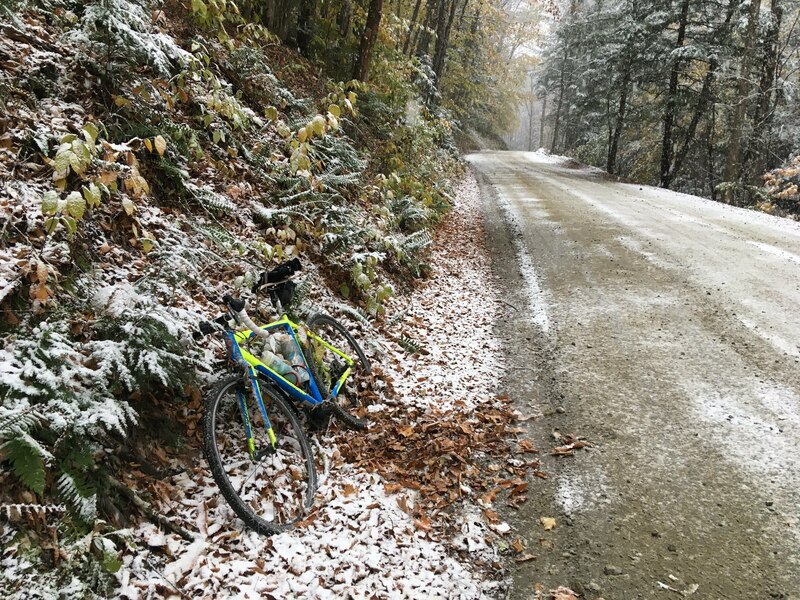 Worse, Guillaume’s sinking saddle struck for a second time, retreating into his seat post like a spooked tortoise poked by an overzealous eight-year-old, and leaving him unable to hold the pace. 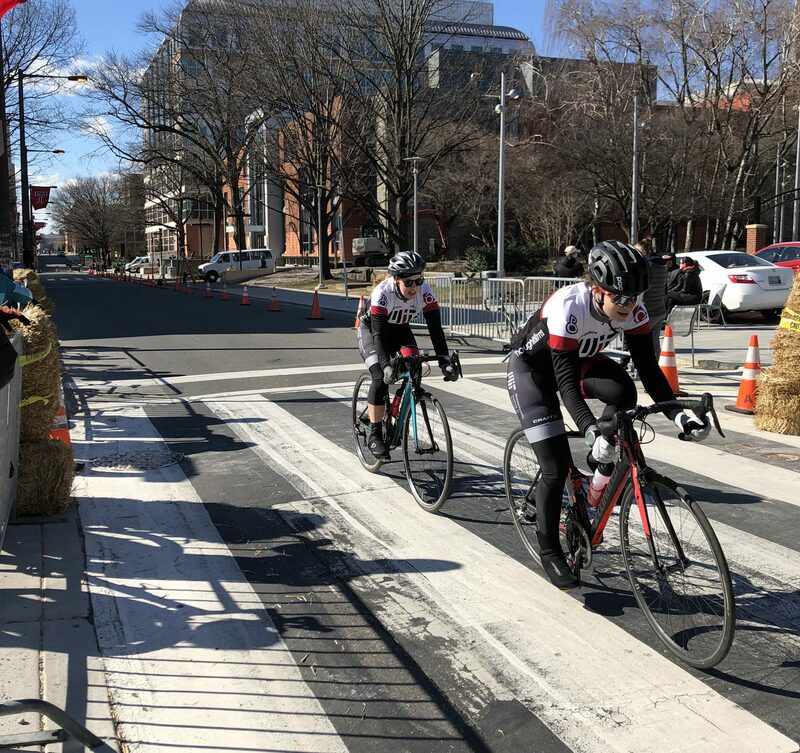 Joanna and Sarah off the front in the crit! 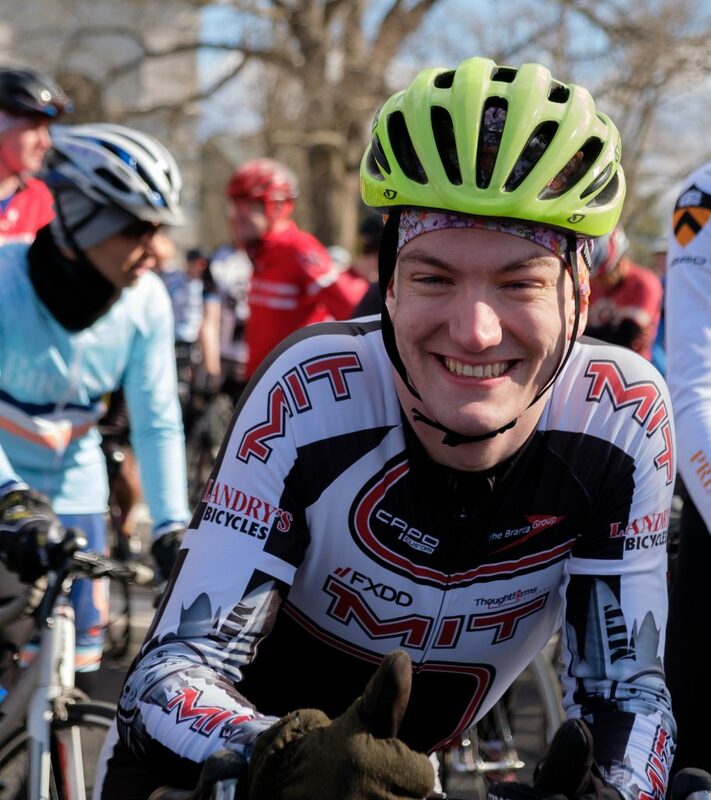 Other MIT riders finished well in the crit too! 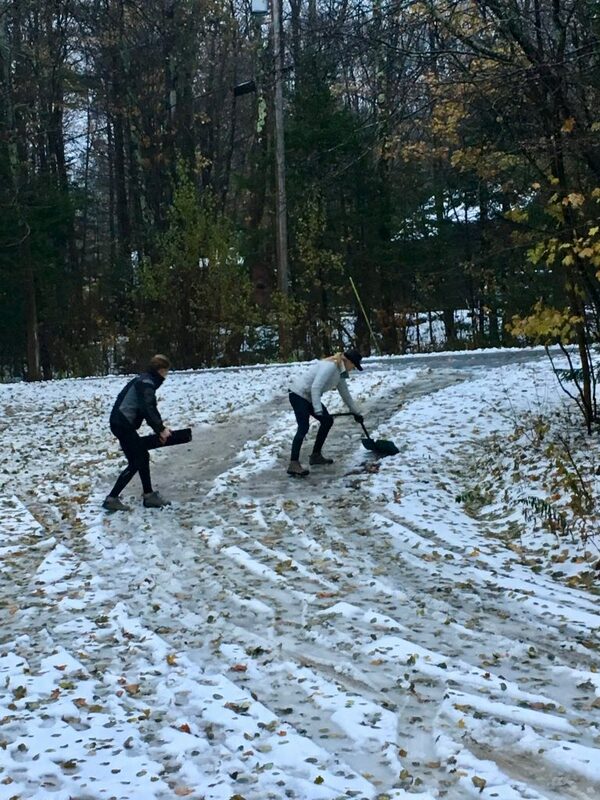 Notably Sarah and Joanna attacked early on and spent the rest of the race practicing their 2-person paceline skills, and lapping much of the rest of the field. 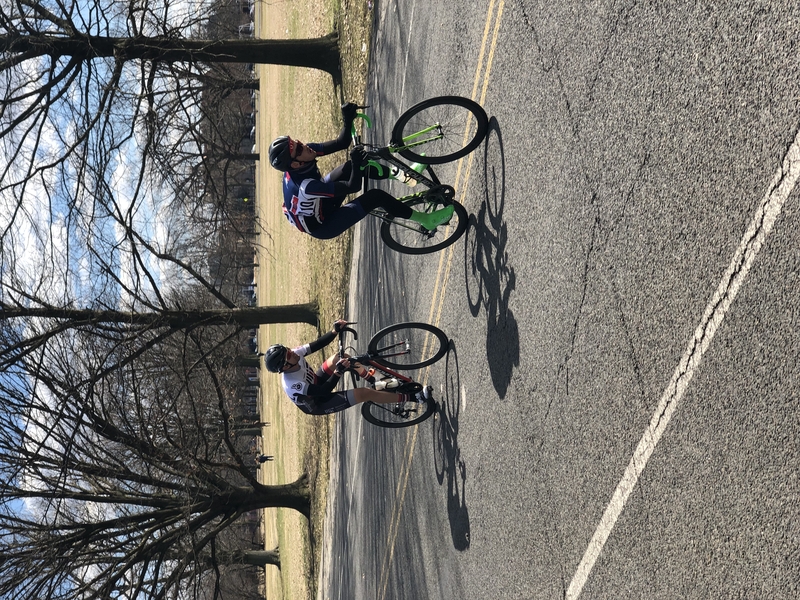 Miles spent most of the men’s C race attacking and finished 8th, right behind Dmitro, who employed a less aggressive strategy that left him with more energy at the finish. In the strung-out men’s D race, Nic worked together with some UVM riders, placing in the middle of the field, and Guillaume pulled himself from the race due to his seatpost woes. In the men’s B race, Quinn worked hard for a friend from Tufts and finished with the pack. 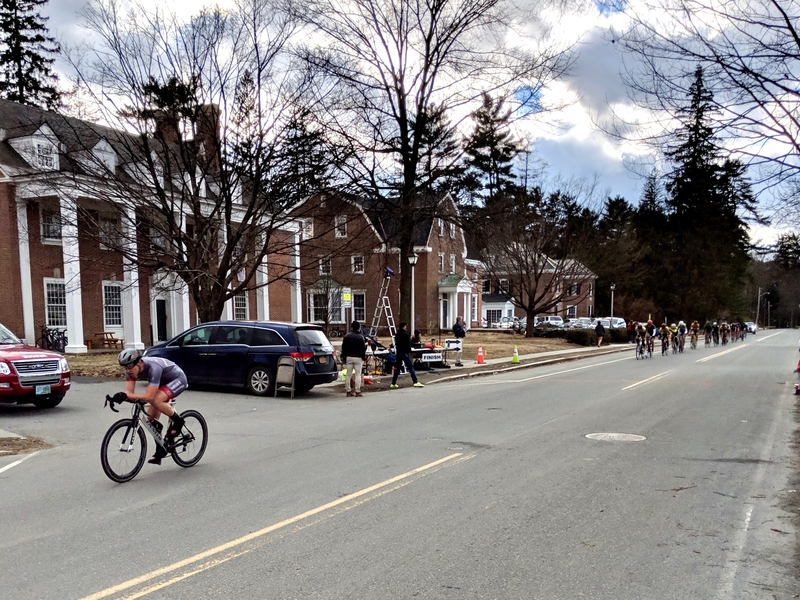 Tori spent the women’s A/B race in good position near the front of the pack but unfortunately suffered a mechanical with half a lap to go; Amy brought up the rear, finishing 7th. Overall it was a great weekend of racing, and we’re looking forward to Bucknell in two weeks! 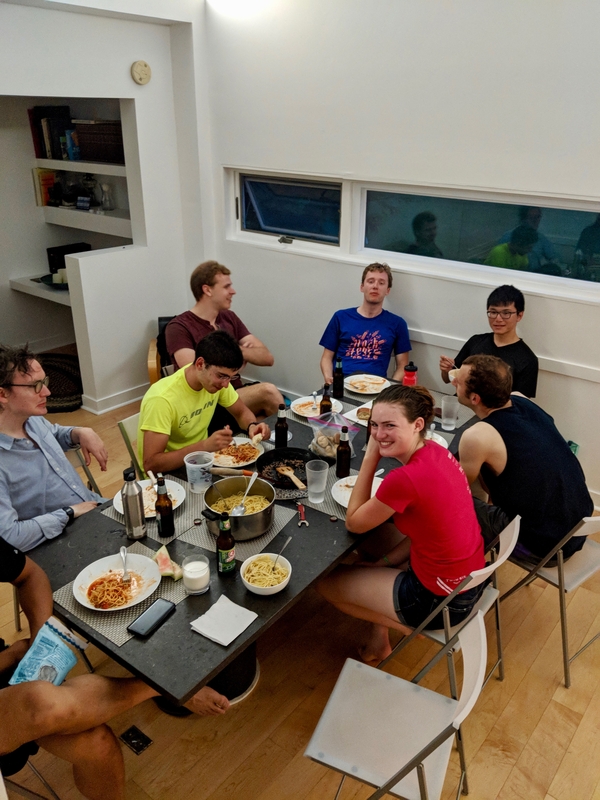 On September 15th, eleven of us took part in an annual MIT cycling tradition – volunteering at Harbor to the Bay! 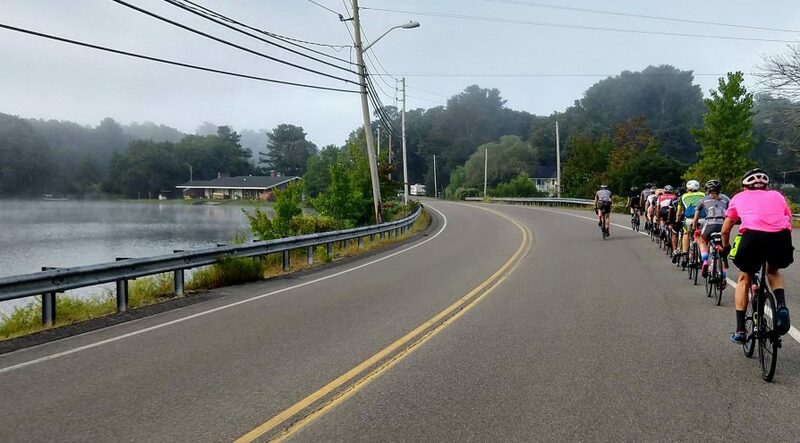 Harbor to the Bay is a charity ride in which participants ride 125 miles from Boston to Provincetown to raise money for local HIV/AIDS organizations. As marshals, we stand at intersections along the route to direct and cheer on riders. 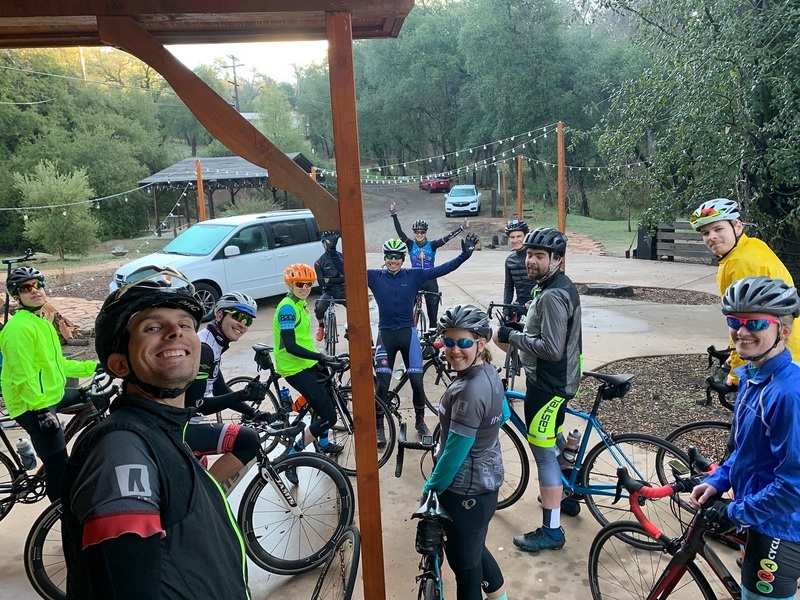 This means that we wake up extra early to ride out to our marshaling spots (between 62 and 114 miles into the route) before the participants arrive. Once all the participants pass us, we continue on our way to Provincetown, picking up the other MIT marshals as we go. 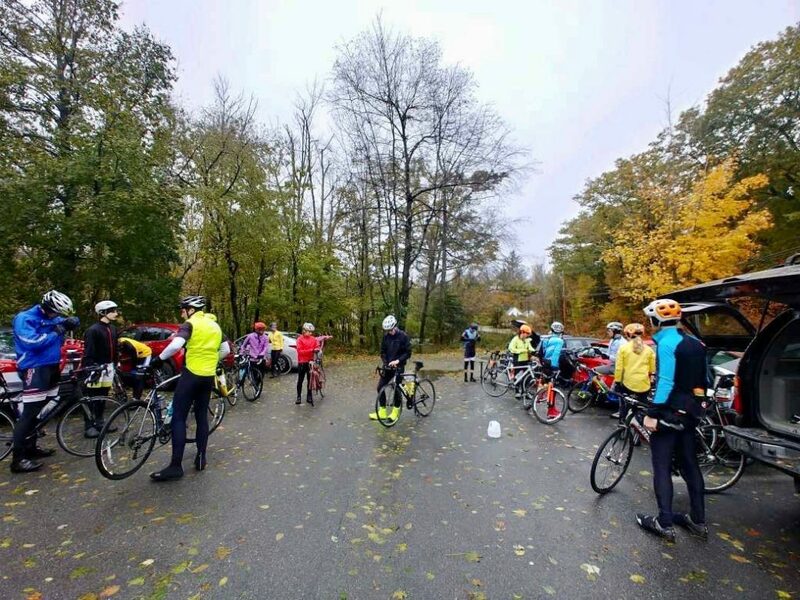 We really enjoy volunteering at this ride, as it allows us to participate in a well-supported ride along beautiful roads and paths on Cape Cod, while also supporting a great cause. 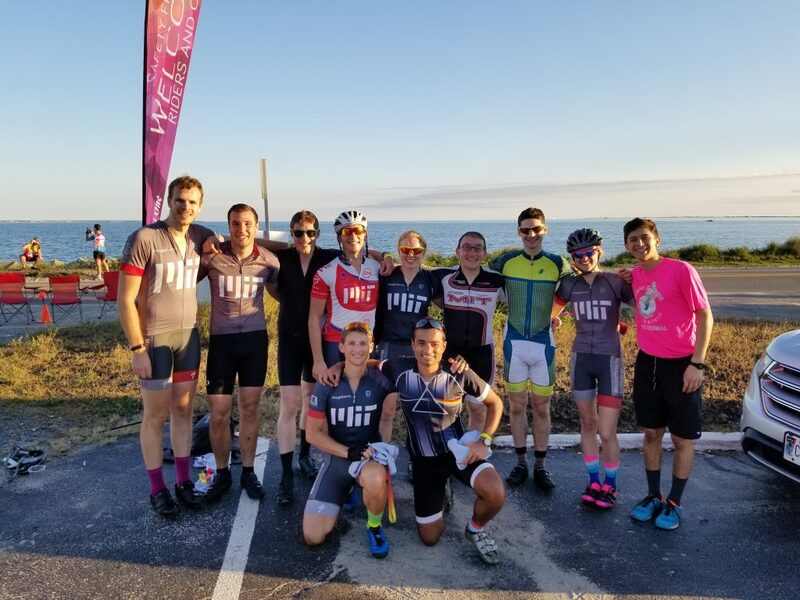 “I was very excited about this ride: Harbor To the Bay was my first long ride with the MIT team, but also my first experience volunteering for the cycling community. One can easily imagine how frustrated I was when, 10 meters before the start I got a flat after rolling on a tiny shard of glass. Since my rim+tire combination makes it *extremely* hard to change a tube, I really thought I woke up so early (3:50 am) for nothing. 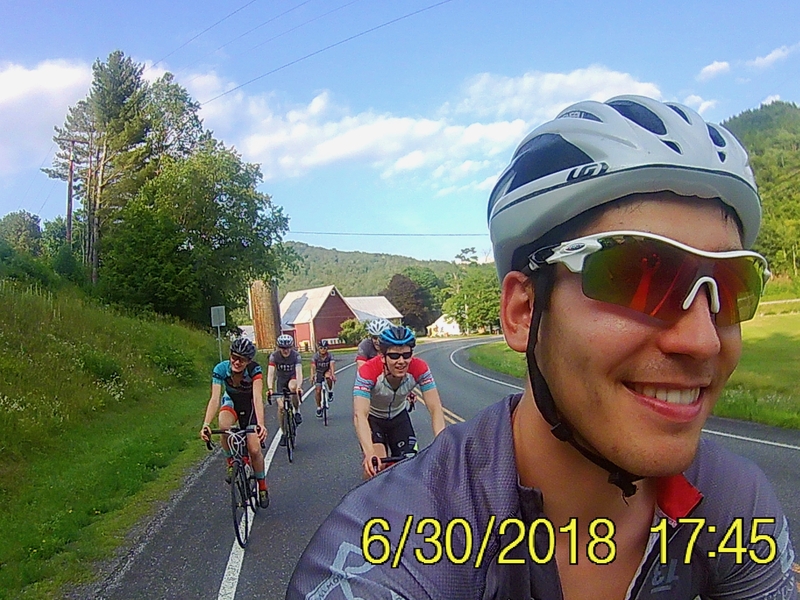 But thanks to our road captain and his unprecedented dexterity with tire-levers and 30 minutes of hard work, we were on our way (~1h ahead before the regular riders). Enjoying lunch near Sagamore bridge. The first part of the ride was very dark and misty but when the sun rose we enjoyed very nice weather. We stopped near Sagamore Bridge for lunch. I was genuinely amazed by the work done by the organizers. The volunteers were very enthusiastic and helpful and the amount of food, drinks and snacks was way beyond my expectations. Our stomachs and back pockets full of food, we resumed our journey towards the Cape, gradually leaving some of us at their marshaling points. Around 12:15pm, Berk and I reached our intersection located at the top of a hill only 8 miles from the finish line. We spent more than 4 hours cheering and directing the exhausted, yet smiling participants (We even got our hands on a cow bell at some point !). 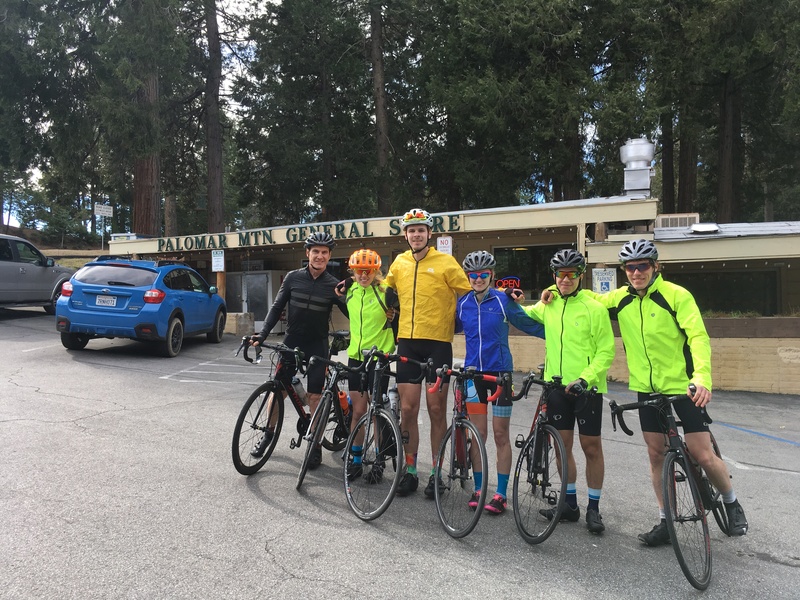 We regrouped with the rest of the team after the sag wagon passed us. 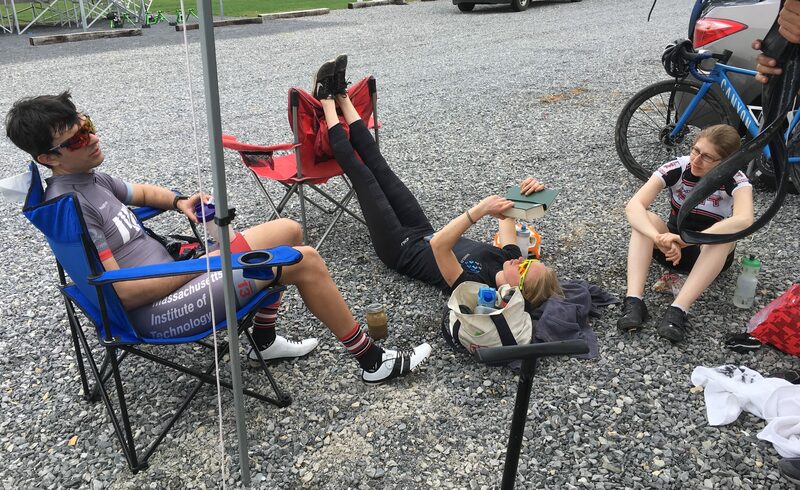 Relaxing at a pit stop about 90 miles into the ride. 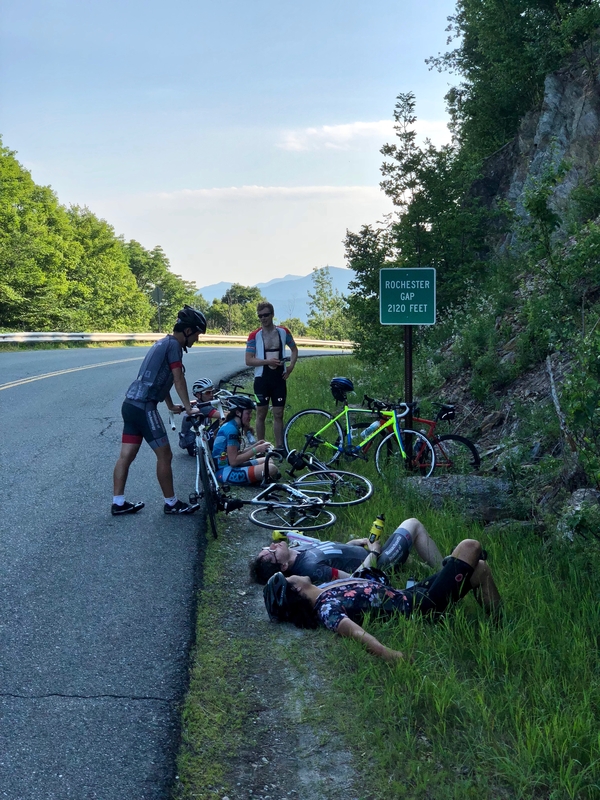 This summer, a group of MIT cyclists headed to Vermont to tackle the ‘Six Gaps’, a 130-mile ride with 12,500 ft of climbing that travels over six passes in the Green Mountains. 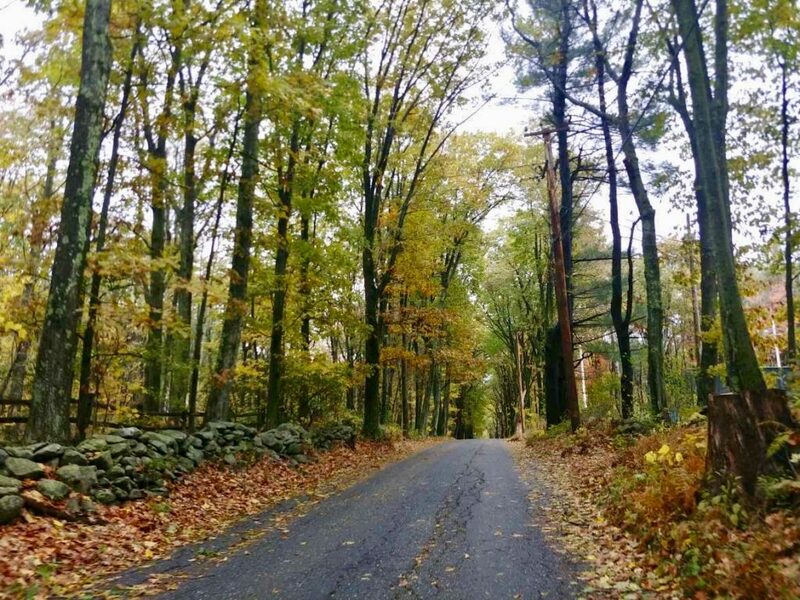 The ride includes Lincoln Gap, which has been crowned the steepest mile in America and features a sustained grade of 24% near the top. 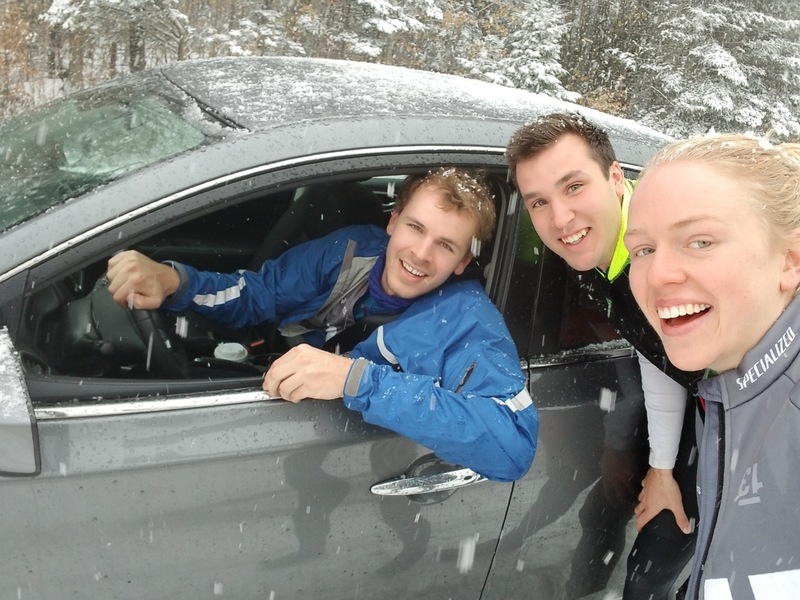 Read below for some pictures and accounts of the ride! Enjoying the Vermont scenery on a beautiful, sunny day. Taking in the view at the top of Appalachian gap, our third gap of the day. All smiles on the flats! Recharging at the top of Rochester gap, our fifth gap of the day.